Reminder: Unless otherwise noted, all magazines are used, and condition varies from near-mint to not-so-hot, Please note that these publications come from various sources, and may have been stored in a smoking environment. I'll try to note obvious defects, but may miss something. 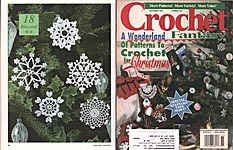 Crochet Fantasywas published by All American Crafts, Inc. 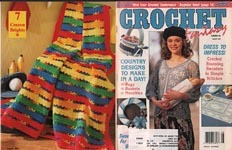 Patterns included both written instructions and diagrams for symbol Crochet. Due to the variation in quality of the paper, some pages may be age- yellowed. Crochet Fantasy No. 76, July 1992. 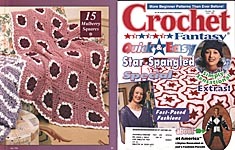 FASHIONS & ACCESSORIES -- Fanfare Fun, Lilac Perfection, Sparkle Plenty, Chenille Shawl, Rag Bag, Floral Accent; CHOICE AFGHANS -- BabyBlocks, American Cuddle Bunny, Baby Bundle- Ups, Daisy Discs; KIDS' COLLECTION -- Kitty Cardigan, Little Angel; HOME IMPROVEMENTS -- Petal Power, Budding Beauty, SIde Effect, Sugar Shells, Star Bright, Window Wreath, Daffodil Delight, Sunny Accessories. Very good used condition. Crochet Fantasy No. 77, August 1992. 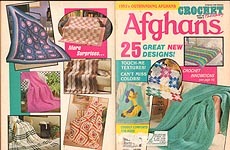 SUMMERTIME STYLES -- Cable Capers, SUnny Delight, Suit Yourself, Meadow Lark, Color Clout, Tropical Splash; TOPS FOR TABLES -- Matrimonial Square, Pearl Essence, Rose Garden Tablecloth, Summer Rose Accessories, Frou- Frou, In the Pink, Shooting Star, Grecian design; A SUMMER SURPRISE -- Daisly Decor; OUTSTANDING AFGHANS -- Cuddlespun, Lover's Lace Afghan; BRIDAL BOUTIQUE -- Ceremonial Pillow, Bridal Gift Bag, Wedding Bell Cake Top, Sweethearts. Very good used condition. 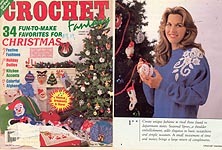 Crochet Fantasy Christmas, No. 79, November 1992. 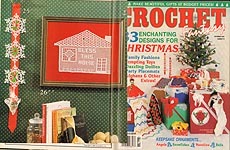 FESTIVE FASHIONS -- Party Lines, Baugles & Bows, Light Bright, Magenta Magic, Enchantment, Bundle of Joy; TOYS FOR TOTS -- Christmas K-9, Holly Belle, Bear Hugs; AFGHAN ARRAY -- Twinkling Tiers, Celebration Symmetry; HOLIDAY HANG- UPS -- Victorian Stocking, Wintry Welcome, Joy Potpourri, Bless This House, Cinnamon Scents; TABLETOP TREATS -- Taper Capers, Festive Trio, Seasonal Setting; TRIM THE TREE -- Granny's Miniskirt, Snow Patch, Bejeweled Bell, Heaven Sent, Jingle Bells, Holiday Ball, Mailbos Merriment, Guardian Angel. Very good used condition. 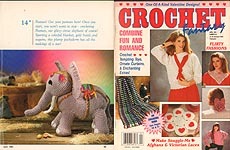 Crochet Fantasy, No. 80, January 1993. FASHION PLATES -- Fluorescent Fun, Uniquely Yours, Feathery SNowflakes, Captivating Caps, Beret Array, Button Up, Seasonally Sweet; DELIGHTFUL DOILIES -- Stunning Star, Christmas Corners, Floral Duet, Camouflage Trio, Sixpence; DINING SPLENDOR -- Winter Snow, Snowflake Accessories, Hemmed With Prayer, Cocoa Mat; HOLIDAY HOW-TO'S -- Angelic Impressions, Christmas Corners, Seasonally Sweet, Holiday Charms, Country Christmas, Angelina, One of a Kind. Very good used condition. 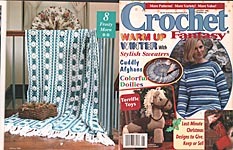 Crochet Fantasy Afghans, No. 81, March 1993. STRIPES & RIPPLES -- Fiesta, Raspberry Parfait, Cottage Comfort, Sand & Sea, Gentle Ripples: AFGHAN POTPOURRI -- Schoolhouse Sampler, Tender Hearts, Plaid Perfection, Coral Cascade; CROCHETED CHARACTERS -- Silly Goose, The Last Unicorn, Mystical Dragon, Patchwork Bear; TEXTURED SOLIDS -- Pumpkin Patch, Misty Blue, Cherokee Rose, Seafoam Sensation; MOTIF MAGIC -- Harmony, Playful Patchwork, Field of Daisies, Patchwork Bear, Meandering Mauve, Opulent Rose; PILLOW TALK -- Unicorn Pillow, Scarlet Tanager Pillow, Bluebird Accent, Gentle RIpples. Very good used condition. Crochet Fantasy No. 82, April 1993. CUPID'S CORNER -- Romantic Snood, Courtly Collar, Have A Heart, Treasured Trim, Keepsake Corner; CAPTIVATING CURTAINS -- Victorian Valance, Curtain Call; TEMPTING TOPPERS -- Graffiti Graphics, Flirty Fun, Lady Fair, Laceworks, Sweetheart Sweater; ALLURING AFGHANS -- Granny's Heart, Stained Glass; TABLEMATES -- Simplicity, Moon Flower, Dancing Leaves, Beginner's Banquet, Golden Flourish. Very good used condition. Crochet Fantasy No. 83, May 1993. SPRING FASHIONS -- Starlit Tunic, Cloud Puff, Pastel Puff, Beyond Basics, Captain's Mate, Shipshape, Daffodil Delights; DECORATIVE ACCENTS -- Spring Bonnet, NotableTulip, Rustic Rugs, Textured Toss; DOILY DELECTABLES -- Wild Flower Bouquet, Shy Violet, Perennial Favorite, First Blooms, Openwork Oval, Sunflower; AFGHAN ARRAY -- Rainbow Reflections, Fisherman's Finest, Thistledown. Very good used condition. Crochet Fantasy No. 84, July 1993. NURSERY TIME -- Baby Sweetheart, Grama?, Red Riding Hood; TOPS FOR TABLES -- Double Dutch, Ray of Hope, Pleat Repeat, Timeless Tulips, Lime Time, Rose Parade, Spring Beauty; FASHION SENSE -- Sherbet Cooler, Sprinkle Top, Coconut Confections, Vanilla Ice; AFGHAN ARTISTRY -- Cross My Heart, Raspberry Rhapsody; SINGS OF SPRING -- Carnation Quartet, Monarch Magnet, Swallowtail Butterfly, Sunlit Butterfly. Very good used condition. Crochet Fantasy No. 85, Aug. 1993. 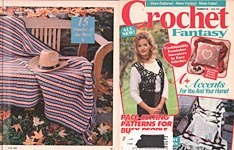 Designs include: WARM WEATHER TOPS -- Aztec Topper, Casual Creation, Summer Shell; TOPS FOR TABLES -- Slice of Summer, Fair & Square, Champagne, Blossom, Radiant Runner, Sunlit Garden, Picot Lace, Diamond Cut Runner; FASHION ACCENTS -- Pearly Barrette, Lacy Hair Bows, Sky Blue Snood, Rose Bouquet Collar; CROCHETED CHARACTERS -- Take A Gander, Busy Bee Magnet, Mama Bear Doorstop; SUMMER AFGHANS -- Watermelon Warm- Up, Black- Eyed Susan Spread. Very good used condition. Crochet Fantasy No. 85, Aug. 1993. 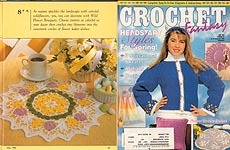 Designs include: WARM WEATHER TOPS -- Aztec Topper, Casual Creation, Summer Shell; TOPS FOR TABLES -- Slice of Summer, Fair & Square, Champagne, Blossom, Radiant Runner, Sunlit Garden, Picot Lace, Diamond Cut Runner; FASHION ACCENTS -- Pearly Barrette, Lacy Hair Bows, Sky Blue Snood, Rose Bouquet Collar; CROCHETED CHARACTERS -- Take A Gander, Busy Bee Magnet, Mama Bear Doorstop; SUMMER AFGHANS -- Watermelon Warm- Up, Black- Eyed Susan Spread. Good used -- overall wear, half- moon- shaped stain in top margin of pages (looks like a coffee drip). Crochet Fantasy No. 86, October 1993. AUTUMNAL AFGHANS -- Strawberry Sundae, Earthtone Texture; BACK TO SCHOOL BONUS -- A+ Apple; TABLE TALK -- Posy Patch, Harvest Time, Ring Toss, Broomstick Lace Runner; FALL FASHIONS -- It's A Cinch, Autumn Artistry, The Long & Short of It, American Made; THE YOUNGER SET -- Kit's Catch, Little Miss, Clover, Alfalfa; HALLOWEEN TREATS -- Jolly Jack- O- Lantern, Raggedy Wig, Pilgrim Pumpkin, Pumpkin Head, Pumpkin Placemat. Very good used condition. Crochet Fantasy No. 87, November 1993. 34 projects include Seasonal Spray shoulder embellishment, Holiday Sweater, Bells & Berries Corsage, Special Edition Pullover, cap and sweater child's Sledding Set, Party Polo sweater for little girls, Dress Blues set for babies; Mister Mittens, Evergreen, and Snow White afghans; Sugarplum Tree Skirt, Rudolph Potholder, Christmas Tree Trivet, Jolly Santa, Holiday Hot Pad, Stocking with Name, Season's Greetings and Wintry Welcome hangings, Snowflakes, Bejeweled Balls, Little St. Nick, Musical Reindeer, Festive Floral doily, Ladies Dancing doily, Ho Ho Ho two-color filet runner, and Ribbon Candy Placemat. May have bottom of cover torn off, but otherwise good used condition. 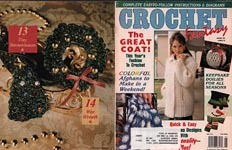 Crochet Fantasy No.88, Jaunary 1994. WINTERWEAR -- Wintry Horizons, Dynamic Duo, Tiffany, Cozy Accessories; TOYS AND TREASURES -- A Beary Christmas, Holiday Hanger, Santa's Place, Mouse Claus, Folk Angel; HOLIDAY DECOR -- Poinsettia Tree Skirt; AFGHANS & PILLOWS -- Victorian Rose, Cranberry Cuddler, Palatial Pillow, Primrose Pillow, Seasonal Stripes, The Heart of Christams, Glitter Afghan; DECORATIVE DOILIES -- Crimson Beauty, SImple Interest; CHRISTMAS KITCHEN -- Stuffed Stocking, Christmas Surprise, Snowman Potholder, Holiday Chimes, Handy Hang- UP. Cover torn at spine, writing on cover; otherwise, very good used condition. 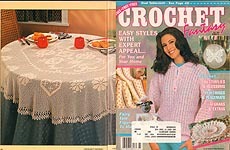 Crochet Fantasy No. 93, August 1994. 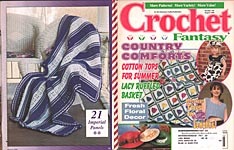 FUN FASHIONS -- Sand Castles, Blue Mist, Cloud Cover, Daffodil FIlet; ACCESSORIES -- Nostalgic Necklace, Yankee Doodles, Bridal Sachet; COUNTRY COMFORTS -- Blue on Blue, Rustic Rug, COllector's Basket, Country Home Wreath, A Tisket A Tasket, Sunny Mug Rug, Gingham Hot Pad; AFGHAN OPTIONS -- Crayon Brights, Lacy Lap Robe, Flutterbye; TABLETOPPERS -- Love Doves, Heart of My Heart, A Country Place, Rose Trellis, Apple Blossom, Summertime, Diamond Delight. Very good used condition. Crochet Fantasy No. 94, October 1994. FALL FASHIONS -- Fringe Dressing, Tasseled Tunic, Autumn Spectrum, Basic Bands; AUTUMNAL ACCESSORIE -- Nail Head Necklace Set, Bunch of Scrunchies, Hats Off; ARTISTIC EXPRESSION -- Masquerade Mask & Fan, Cornucopia; DOILY DECOR -- Pebble Beach, Criss Cross, Poppy Field, Perennial Posy; KID'S COLLECTION -- Two- Toned Topper, Blossoms Baby, Ballerina Bear; AFGHANS & THROW RUGS -- Kaleidoscope, Emerald & Amethyst Afghan, FLoral Accent Rugs, Country Rose. Very good used condition. Crochet Fantasy No. 95, November 1994. FESTIVE FINERY -- Angelspun Elegance, Royal Christmas, Roses & Rings Set; FOR KID'S SAKE -- Festive Cardigan, Frosty Fashion, Christmas Charms, Princess Noel; ORNAMENTAL CROCHET -- Apple Ornament, Tasseled Teardrop, Gifts Basket, Tinkle Ball, Forever Snowflakes; CHRISTMAS KITCHEN -- Snowflake Potholder, Holiday Trivet; SEASONAL SPREADS -- Yuletide Train, Granny's Tradition, Sparkling Tree Skirt; DECORATIVE ACCENTS -- Old St. Nick, Poinsettia Pillow, Dove of Peace, Ribbon Candy Rug; TABLETOP TREASURES -- Sugarplum Doily, Tannenbaum Mats, Celehration Set, Snowy Pines. Cover torn at staples, writing on cover; pages in very good used condition. Crochet Fantasy No. 96, January 1995. 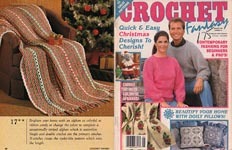 FASHION TRENDS -- Beige Beauty, Wool Rich, Hoodwinked, Crimson Collar, Tiny Tannenbaum, Wee Wreath; HOME FOR THE HOLIDAYS -- Patchwork Tree Skirt, Patchwork Stocking, Holly Wreath, Glad Tidings, Frosty Fella, Rocking Horse Pillow, Holiday Warmth; AFGHANS & PILLOWS -- Winter Sky, Cranberry & Evergreen, Rocking Horse Pillow, Holiday Warmth; TOPS FOR TABLES -- Friendship Ring, Antique Rose, Holly Wreath, Glad Tidings; ORNAMENTAL CROCHET -- Christamas Crystals, Snowballs, First Christmas. Very good used condition. Crochet Fantasy No. 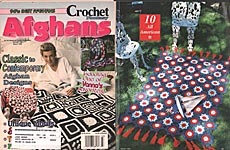 97, March 1995: "95's Best Afghans". 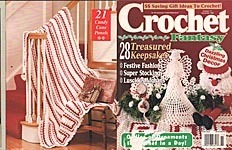 Designs include: MAINLY MOTIFS -- Grandma's Flower Garden, Ebony & Ivory, Secret Garden, Lollipop Lace, Grape Granny Set; PANEL DISCUSSION -- Seafoam, Peach Melba, Secret Garden, Lap Wrap; PICTURE THIS -- Rose Cameo, Tiger Lilies, Baby Bronto; ALL- IN- ONE AFGHANS -- Tulip Time, Mauve Medley, Bursts & Blocks, Aran Allure, Wintermint, Shell Shock, Mohair Magic; CHILD'S PLAY -- Alphabet Afghan. Very good used condition. Crochet Fantasy No. 98, April 1995. Designs include: FASHIONS WITH FLAIR -- Nostalgia, Love Connections, Ebony Elegance, Laceworks, Valentine Confections; ALLURING ACCESSORIES -- Amorous Accents, Pink Passion; SOUTHWEST CORNER -- Shades of the Weest, Beaded Bag, Southwest Hot Spots, Dream Catcher, Conchos & Cacti; DARLING DOILIES -- Love & Friendship, Heavenly Hearts, Heart of My Heart, SPinning Hearts, Desert Flower: KITCHEN CROCHET -- Dinner Companion, Budding Beauty, Romantic Rose, Southwest Hot Spots. Label crossed off on cover, but otherwise good used condition. Crochet Fantasy No. 99, May 1995. 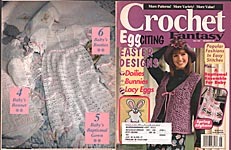 Designs include: SPRING SWEATERS -- Springtime, Victorian Vest, Purple Blossom; NURSERY TIME -- Baby's Bonnet, Baby's Baptismal Gown, Baby's Booties, Baby's Brunch, Baby's Bib, Baby's Bottle, Sweet Addition Afghan; EASTER PARADE -- Easter Elegance, Bunny Lace, Eggcitement, Happy Hopper; TABLETOP TREASURES -- Mood Indigo, Placid Placemat, Easter Elegance, Bunny Lace, Weekend Runner, Rose Garden; AFGHANS -- Lilac Frost, May Flower. Label on cover; otherwise very good used condition. Crochet Fantasy No. 100, July 1995. 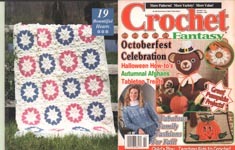 Designs include: FASHION FAVORITES -- Pure Inspiration, Broomstick Lace Sweater, Contemporary Classic, In Vest; KID'S COLLECTION -- Sporty Special, Kool Kat, Pastel Princess; ENCORE AFGHANS -- Keely's Wildflowers, Striking Stripes, Chevron Challenge; TIMELY TABLETOPPERS -- Carnations, Mary's Legacy, Purple Pineapples, Rose Festiveal Oval, Lattice Lace, Marathon Runner; HEIRLOOM EXTRAS -- Pennsylvania Dutch Cafe, Summer Slumber, Flower Girl's Basket. Also: Meet Designers Michele Thompson, Lucille LaDlamme, and Valmay Flint. Label on cover; otherwise very good used condition. Crochet Fantasy No. 101, August 1995. 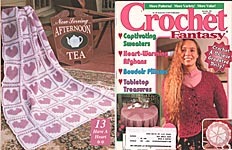 Designs include: FUN FASHIONS -- Sea Breeze Set, Tropicana Top, Contemporary Crop Top, Winning Waistcoat, Long On Looks; EXCEPTIONAL ACCESSORIES -- Patriotic Braceletn< Beaded Bangle, Lover's Lace Edging, Stylish Satchel; EXCITING AFGHANS -- Kiss Me Quick, Blue Heron, Desert Dream; TERRIFIC TABLETOPPERS -- Tulip Treasure, Field of Daisies, Tea Rose Doily, Easy Elegence, Broomstick Lacemat, Shell Progression, Summer Banquet. Label on cover; otherwise very good used condition. Crochet Fantasy No. 102, October 1995. SWEATER SET -- October Vest, Stylish Tunic, Playful Pastel, Fringed Fashion, Cardigan Caper; FASHION ACCESSORIES -- Jeweltone Bag, Twilight Blue Necklace; HALLOWEEN HIJINKS -- Glowing Ghost, Halloween Pin Pals, Pumpkin Patch; AUTUMNAL AFGHANS -- Autumn Sunrise, School of Fishes, Iris Bed & Bath; TABLETOPPERS -- Feast of Flowers, Wheat Field, Amber Glow, Heavenly Hexagon, Plentiful Pineapples, Purity. Label on cover; otherwise very good used condition. Crochet Fantasy No. 103, November 1995. FESTIVE FINERY -- Snowy White, Denim Ski Sweater, Elegant Evening Bag, Gilded Clutch; JUST FOR KIDS -- Panda- mine, Panda Pal, Peppermint Cozies, Set for Santa; TREE TRIMS & HANG- UPS -- Herald Angel, Party Ball, Beaded Ball, Rose Ball,, Crystal Ball, Popcorn Ball, Blizzard, Festive Filet, Storybook Stockings; HOLIDAY DECOR -- Stellar Runner, Christmas Wrapping, Candy Cane Bolster, Holly Sprig Placemat, Blanket of Snow, Holiday Cheer, Candle Lace; UNDER THE TREE -- Twelve Days Tree Skirt. May have label on cover, wear at spine; pages in very good used condition. Crochet Fantasy No. 104, January 1996. FINE FASHIONS -- LAmb's Pride Pullover, Burgundy Wine, Baroque Shawl, Bluelines, Sugarplum Sweater Set; EXCEPTIONAL ACCESSORIES -- Victorian Choker, Aran Scarf & Hat; OUTSTANDING AFGHANS -- Frosty Morn, Tannenbaum Afghan; DYNAMIC DOILIES -- Blue Heaven, Star Bright; LAST MINUTE CHRISTMAS -- Christmas Trim, Holiday Placemat, Penelope Pony, Bonita Burro, A Touch of Gold, Wee Wreath Pin, Festive Button Cover, Granny's Garland, Candy Cones. Wear at spine; pages in very good used condition. 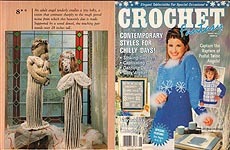 Crochet Fantasy Afghans, No. 105, March 1996. MAGNIFICENT MOTIFS -- Stained Glass, Zebra Garden, Snowflakes, All American, Petals & Pearls, Windmill Hearts, Pink Magnolia; YIPES STRIPES -- Ocean Hues, Rustic Ripples, Soft Pastels, Wedgewood Wonder; TWO TONED TREASURES -- Reversible Puff, New Directions, Middle Eastern Pillow; MONOCHROMATICS -- Aran Sampler, Best Friends; BABY MAGIC -- Soft Pastels, Rufles & Rattles; CROSS- STITCHED COMFORTS -- Follow Suit. Very god used condition. Crochet Fantasy Afghans, No. 105, March 1996. Same as above, except CONDITION PROBLEMS: Cover detached --it's here, just pulled off the staples. 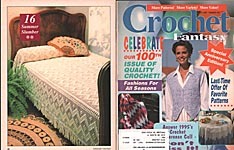 4 pages are loose and the corresponding 4 (Chain Link '95 Conference, Stitches Pages) are missing. 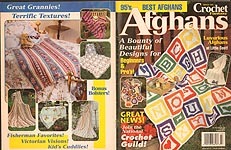 All afghan photos and instructions are here. 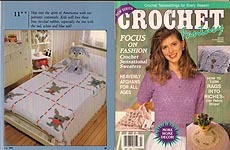 Crochet Fantasy, No. 106, April 1996. 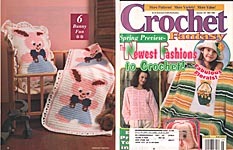 FASHION STATEMENTS -- Blue Spruce, Harmony, All Seasons Cardigan, The Younger Set, Little Sailor; ELEGANT EDGINGS -- Traditional Trim, Borderline; FRILLY FRAMES -- Lacy Frame, Sweetheart Frame; PILLOW TALK -- Victorian Rose Pillow, Valentine Pillow; TABLE LACE -- Romantic Setting, Raspberry Ice, In the Long Run, Dusty Rose Tablecloth, Pretty in Pink; AMOROUS AFGHANS -- Mauve Lace, Have A Heart, Daddy's Little Girl. Mailing label on cover, but otherwise very good used condition. 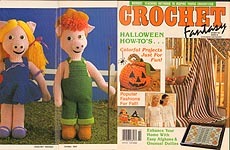 Crochet Fantasy, No. 107, May 1996. SPRING INTO FASHION -- Checkmate, Natural Wonder, Fashion Flair, Blossom Hat, Coral Shells Purse; INFANT ENSEMBLE -- Sunshine Set; SEASONAL SPREADS -- Bunny Fun, Tangerine Coverlet, Garden Basket; TABLETOP BOUQUETS -- Meadow Lace, Spring Medley, Daisy Doily, Peach Blossoms, Springtime, May Petals, Daffodil Filet; EASTER PARADE -- Bunny Fun, Rabgit Roll, Easter Eggs. May have mailing label on cover, but otherwise very good used condition. Crochet Fantasy, No. 108, July 1996. FASHION TRENDS -- Crimson Crop Top, Forget- Me- Not, Ribbon Royale; EASY ACCESSORIES -- Star Flower Necklace, Eyelet Choker, Blue Ribbon Cloches, Quick Cosmetic Bag, Confettin Barrettes; DECORATIVE TOUCHES -- Country Freshener, Easy Edging, Tip- Top Trim, Spring Garden Rug, Floral Lace; TOPS FOR TABLES -- Petite Petals, Easy Elegance, Crazy Squares, Picot Shells, Victory Garden, Diamond Net; WEEKEND AFGHANS -- Plum Panels, Mulberry Squares, Rippple Star; CHILD'S PLAY -- Pastel Rainbow Jacket. Mailing label on cover, but otherwise very good used condition. 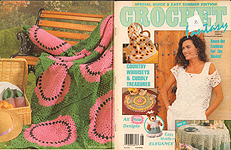 Crochet Fantasy, No. 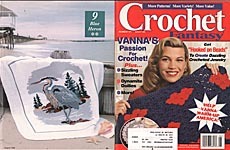 109, August 1996. SUMMER FASHIONS -- Raindrops on Roses, Sassy Trio. Budding Beauty, Milk Maid, Watermelon Hat, Sunhsine & Smiles, Daisy Hat; DINING IN -- Blue Ribbon Set, Quilt Block Placemat, Gilded Lace Tablecloth; COUNTRY ACCENTS -- Ruffled Basket, Stars & Stripes Cover, Country Goose; COLORFUL SPREADS -- Bed of Tulips, Imperial Panels; TABLETOP TREASURES -- Rose Reflections, Woven Wonder, Solitary Rose, Colonial Tiles, Petite Granny Squares, Sumer Blossom. Mailing label on cover, but otherwise very good used condition. Crochet Fantasy, No. 110, October 1996. 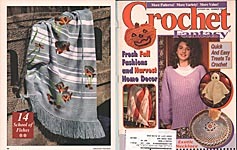 FALL FASHIONS -- Chic Chenille, Regal Jacket, Woodsy Pullover, Autumn Warmers; KID'S CORNER -- Li'l Wrangler, Raspberry Turtleneck, Baby Layette, Pilgrim Bear, Child's Easy- To- Crochet Purse; HALLOWEEN TREATS -- Jack O'Lantern Rug, Trick or Treat, Smiling Pumpkins Mat, Halloween Cover; COZY COVER-UPS -- Autumn Hues, Bountiful Hearts; SEASONAL TABLETOPPERS -- Spider Web, Smiling Pumpkins Mat, Fall Leaves, Birds in Flight, Harvest Home, Teal Lace. Very good used condition. 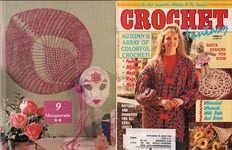 Crochet Fantasy, No. 111, November 1996. 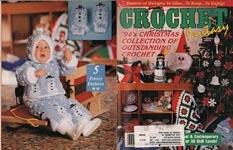 FAMILY FASHIONS -- Crystal White, Holiday Highlander, Dress Blues, Surprise Package; HOME FOR THE HOLIDAYS -- Seasonal Squares, Eternal Light, Santa Candy Can, Sittin' Santa, Festive Tree Skirt, Picture Stockings, Candlelight Supper, Candy Cane Panels; TABLETOP TRIMS -- Holiday Lace, Poinsettia Doily, Christmas Colors, Wreath Doily; ORNAMENTAL CROCHET -- Angelique, Lacy Hat, Petite Ball, Rosy Basket, Snowflakes. Scar on front cover from label removal; otherwise, very good used condition. Page, background, and graphics Copyright © 2005 - 2014, Hook and Web Designs. All Rights Reserved.